By combining USBSwiper with PayPal Here you can process payments on your laptop / desktop computers as well as on your iOS / Android mobile devices with a single PayPal merchant account! Do you want to add a credit card swiper to your existing virtual terminal / web based merchant account? Our credit card processing solution works with Group ISO, PayPal / PayFlow, Authorize.Net, Chase PaymenTech, Intuit Point of Sale, and many more merchant account systems! 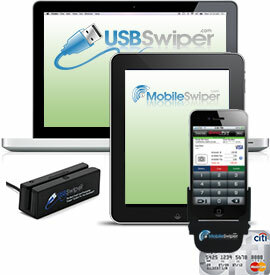 Our USBSwiper software works with both Mac and Windows based computers. You are afforded the utmost in versatility when it comes to equipment you already own. No need to purchase or lease an expensive credit card machine. Short Term Credit Card Processing Needs? If your company only needs to process credit cards once or twice a year, USBSwiper has an inexpensive rental solution for you. See why TopTenReviews calls USBSwiper "one of the best credit card processing services out there," and "as a service with some of the lowest transaction fees, the low-cost merchant account plans are the main benefit to using USBSwiper." "We recently added the USBSwiper thermal receipt printer to our USB swiper setup and it has made all the difference in customer interaction and transaction speed. We were previously using our inkjet printer for receipts and it took forever. The entire USBSwiper Credit Card Processing System was a great purchase." Need an e-Commerce website for your business? Our full line of complete affordable custom e-Commerce websites can stand alone or tie in with our Point-of-Sale Credit Card Processing Solutions. PayPal Star Developer Award for Service to the Community. PayPal Star Developer Award for Most Innovative Application.